Any site with a water drop and flows; natural water falls, small weirs/dams and industrial outflows. With one to ten meters of head and 100 lps to 10,000 lps flow rate. Hydro electricity is the cleanest form of energy available. It can and must play a significant role in addressing concerns about climate change and air quality. Conventional means of generating electricity are dirty and unsustainable. Coal contributes significantly to the summer smog, which leads to thousands of premature deaths and tens of thousands of hospital visits every year. Coal power, oil and gas generation are major contributors to global warming. By contrast, waterpower, produces no greenhouse gas emissions. Small run-of-the-river micro hydro generators, need minimal construction and don’t disrupt the flow of the river downstream, significantly lessening the impact on the environment. And there are many potential sites for run-of-the-river generation including those with existing structures. Hydropower uses turbines to convert the energy of falling water into electricity. Micro-hydro systems usually generate less than 100 kW and are “run of the river” operations that don’t involve large dams or water storage reservoirs, so they generally create very little impact on the local ecosystem. Greater awareness of the potential damage to the planet from global warming has lead governments to take measures to mitigate the impacts of human activity on the climate. With little or no CO2 and other greenhouse gas emissions and high energy payback, hydropower supports clean development and is recognized as being fully renewable and sustainable. Waterpower has been used for centuries to grind grains and, more recently, to generate electricity. Currently it is a major source of energy in Ontario, but much of this comes from big projects. That still leaves thousands of megawatts of untapped potential, however: there are thousands of rivers and streams in the province that could be used to generate electricity. Is a Micro-Hydro System Right for Me? Clearly, the first requirement is to have a suitable stream or river on your property. The amount of energy you can capture depends on the flow rate (how much water flows per second) and the head (the vertical distance it falls). You’ll need at least a year’s worth of data on water flow to decide if it’s worth installing a system at a particular site. An Archimedes Screw system fully installed can cost between 8-10 thousand per kilowatt. Why micro-hydro? Small-scale hydropower is one of the most, long term cost-effective and reliable energy technologies to be considered for providing clean electricity generation. A high conversion efficiency (70 – 90%), by far the best of all energy technologies. A high capacity factor (typically >50%), compared with <10% for solar and around 30% for wind. A high level of predictability, varying with annual rainfall patterns. A good correlation with demand i.e. output is maximum in winter. 24 hour generation i.e. works at night. It is a long-lasting and robust technology; systems can readily be engineered to last for 50 years or more. Many hydro installations are close to 100 years old. Well-designed schemes are also environmentally benign. 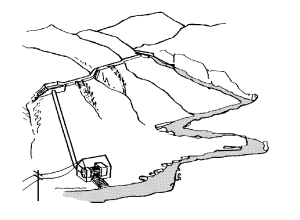 Small hydro is in most cases “run-of-river”; in other words any impoundment is quite small, often an existing weir, and little or no water stored. Hydraulic power can be captured wherever a flow of water falls from a higher level to a lower level. This may occur where a stream runs down a hillside, or a river passes over a waterfall or man-made weir, or where a reservoir discharges water back into the main river. The vertical fall of the water, known as the “head”, is essential for hydropower generation; fast-flowing water on its own does not contain sufficient energy for useful power production except on a very large scale, such as offshore marine currents. Hence two quantities are required: a Flow Rate of water Q, and a Head H.
Sites where the majority of the head comes from a single impoundment and have a gross head generally less than 10 m would normally be classed as “low head”. Sites from 10-50 m would typically be called “medium head”. Above 50 m would be classed as “high head”. The Flow Rate (Q) in the river, is the volume of water passing per second, measured in m3/sec. For small schemes, the flow rate may also be expressed in litres/second where 1000 litres/sec is equal to 1 m3/sec. Energy is an amount of work done, or a capacity to do work, measured in Joules. Electricity is a form of energy, but is generally expressed in its own units of kilowatt-hours (kWh) where 1 kWh = 3,600,000 Joules and is the electricity supplied by 1 kW working for 1 hour. Power is the energy converted per second, i.e. the rate of work being done, measured in watts (where 1 watt = 1 Joule/sec and 1 kilowatt = 1000 watts). 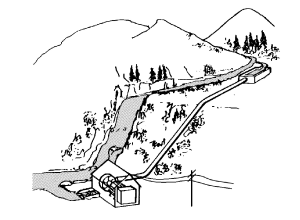 In practice, sites that are suitable for small-scale hydro schemes vary greatly. They include mountainous locations where there are steep, fast-flowing mountain streams and lowland areas with wide rivers. In some cases development may involve the refurbishment of a historic water power site. In others it may require an entirely new construction. 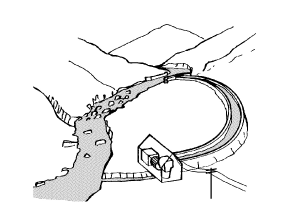 This section illustrates the four most common layouts for a mini-hydro scheme. Archimedes Screw systems are only for low head sites. And for low head schemes, there are two typical layouts as shown in diagram 3 and 4 below. Where the project is a redevelopment of an old scheme, there will often be a canal still in existence drawing water to an old powerhouse or watermill. The purpose of the canal was generally to gain or create head. 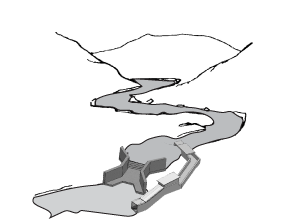 It may make sense to re-use this canal as in diagram 3. The most preferred option by GreenBug Energy is represented in diagram 4 below because installing an Archimedes Screw generator beside a natural water fall or dam/weir creates no depleted reach.